Aviation is one of the most technically complex and highly regulated industries in the world. In aviation related disputes, the stakes are always high, and the consequences usually immense, resulting in substantial civil, regulatory, and/or criminal liabilities. 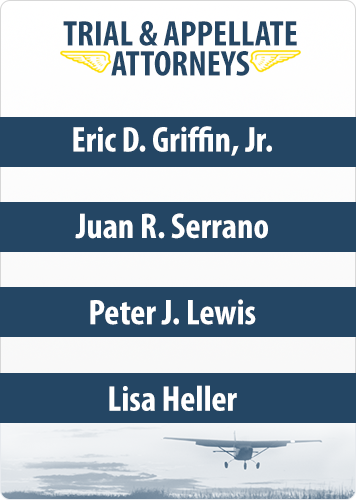 If you need a law firm with a unique focus and experience in the field of Aviation Law, Griffin & Serrano may be a perfect fit for your legal needs. Griffin & Serrano, PA has more than 50 years of combined experience in handling aviation related cases. We have attorneys board certified in Aviation law and licensed to practice in Florida, Georgia and Washington, D.C. We serve an international client base in a variety of aviation and related businesses, industries, and professions in the United Stated and abroad.